Grand Image, Inc. 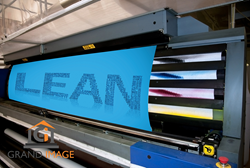 The Leader in Wholesale Grand Format Digital Printing Begins Lean Transformation. To better serve their customers Grand Image, Inc. is going lean! Tamir Luria, Vice President of Operations points out that “while the principles of lean manufacturing are not yet widely accepted in the printing industry, lean is gaining ground as more printing companies strive to be more competitive”. In their continuing effort to expand opportunities that better serve their customers, Grand Image, Inc. is going lean! Lean philosophy focuses on the elimination of activities that do not add value for the customer. This results in quicker turn times, a more polished product, and happier customers. Grand Image is educating lean manufacturing tenets and techniques to all their employees so they become empowered to continuously improve while creating a clean, flexible, productive and quality driven work environment that promotes a harmonious and motivated culture. The logical proven response to fundamental business challenges that lean provides is based on the premise that people, when informed and properly rewarded, develop innovative solutions needed to bolster company growth. Through streamlining production, maximum efficiency is easily and consistently maintained. As wasteful occurrences are eliminated, printing and finishing cycle times are reduced. As a result, customers receive a better product in less time and at a lower cost. Grand Image has hired Matt Morrisette of More Effective Consulting to guide them through the lean process. Matt brings over 18 years of experience, has mentored over 3,500 employees in lean manufacturing, and has worked with over 100 corporations in North America and Western Europe. Grand Image Inc. is based in Hudson, Massachusetts and is the leader in wholesale grand and large format digital printing. The company was founded in 1996 by Eli and Leah Luria and serves resellers of grand and large format indoor and outdoor graphics including fabric graphics, display graphics, self-adhesive prints, billboards, banners, posters, and more.